Twitter is taking over the world. These days, you will know when Tina Fey eats candy for lunch, because she’s micro-blogging about it in 140 characters or less. Drew Olanoff (@drew) is promising to tattoo the @Twitter username of the person who donates the most to the Make-A-Wish Foundation this weekend. He’s checking receipts and no last minute funny business changes to your username will be tolerated. 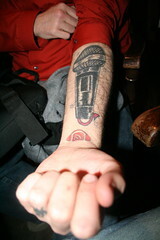 Olanoff already sports an RSS feed logo and a giant microphone tattoo. Presently, the bidding is at $1,000. Hurry, the deadline is Monday, February 16. 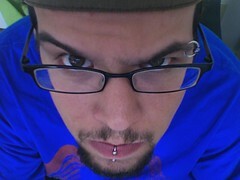 And make sure you follow TattooBlog.com on Twitter.